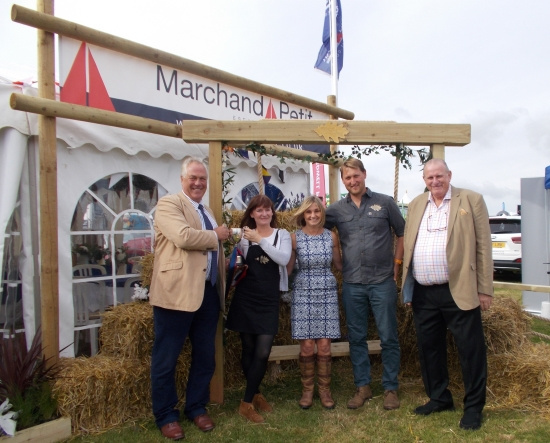 It was celebrations all round on Saturday 2nd September, as the team at Marchand Petit celebrated their second win of the summer for Best Show Stand, at this year’s 135th Kingsbridge Show. The Westcountry’s leading local estate agent demonstrated that the collaborative partnership with local brands is a winning combination; scooping the Best Show Stand with the help of Salcombe Harbour Hotel, South Hams Fencing & Landscaping and local garden centre, Garden Time. Judges were wowed by the impressive and inviting country coastal stand-out set up, commenting on the overall hospitality of the Marchand Petit marquee team. They were delighted with the approach, hard work and investment clearly showcased by all to ensure that visitors were treated to a day out to remember. Bigger and better than ever, the show offered an action-packed day showcasing the best of the South West. Visitors were spoilt for choice with hundreds of stands from food and drink and craft tents, live music, horse shows, vintage and modern tractor displays and a wide range of ring attractions. With many different elements, both inside and out of the winning stand, family run South Hams Fencing & Landscaping team had designed an attention grabbing coastal garden oasis. Complete with handmade tables, haybale seating and a handcrafted seven-foot double garden swing; the garden even featured a Wolf Rock RIB boat that looked at home among the array of beach themed plants and grasses, all provided by Garden Time. Created especially for the show by Wayne and Amy Cocker at South Hams Fencing and Landscaping, Wayne was previously an award-winning show garden exhibitor at Tatton Park, in Cheshire and where the Royal Horticultural Society are holding their 2018 Flower Show, 18th-22nd July next year. Award-winning Salcombe Harbour Hotel added the extra special touch with Pimm’s and prosecco throughout the afternoon, alongside a traditional afternoon cream tea that ensured no one left hungry. With artwork on display by ‘Island Artist’ Emma Carter, which included an exhibit made by Emma with local school children of a giant recycled plastic turtle for a project called Sea Sense. The project celebrates our oceans and coastline, drawing attention to the way we treat the seas and highlighting the dangers of plastics. As the summer draws to a close, the local teams are delighted to end the season on a high note and look forward to working together and building on the success at future local events.